Do you have a large group with a small budget? You’ve come to the right place. Our 48-72 passenger (seats varies on how many adults are on-board) school bus is convenient for field trips, sport teams, social events, and more. 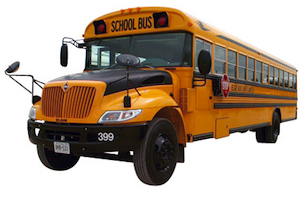 School bus rental can get your large group with an affordable budget safely to your destination. We highly recommended school buses for only those whom are travelling within 200 km radius. This bus best fits sports teams, summer camp outings, day field trips, university rally's and clubbing events. All school buses generally lack in large luggage space, no restroom, and no air conditioning system. Please be advised to take into consideration weather conditions and trip length before you rent a school bus. ** Please note our school buses do not have an AC system. It's used for short trip purposes.